CRUNCH CFD® contains models to simulate liquid fuel/oxidizer injection and impingement breakup to discrete phase droplets which undergo secondary breakup and vaporization. 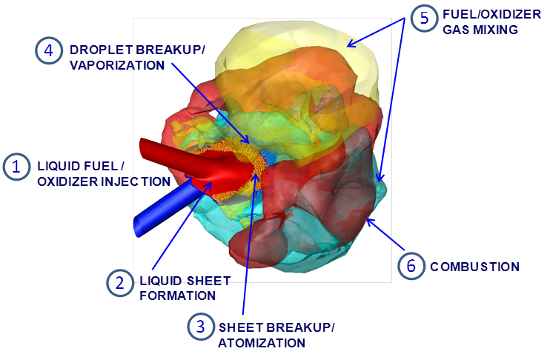 Combustion of the fuel/oxidizer vapor is simulated using one of several available combustion models. A generalized framework allows for simulation of multiple injectors at arbitrary orientations.